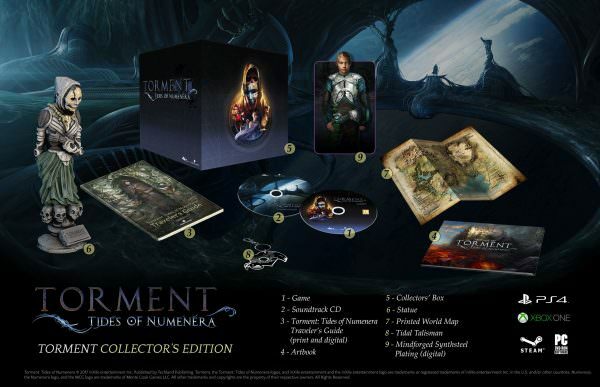 Torment: Tides of Numenera is an upcoming role-playing game developed by InXile Entertainment. It is slated to be released on February 28th 2017 for PS4, Xbox One and PC. It is the spiritual successor to the critically acclaimed 1999 RPG classic Planescape: Torment. This page will be updated with more information as it becomes available. Numenera is an award-winning science fantasy tabletop role-playing game (RPG) set in the far distant future, written by Monte Cook. It has been translated into Italian, German and French. Numenera is set on Earth approximately one billion years in the future. At that time there have been eight previous worlds, each world stretched across vast millennia of time. Each played host to a race whose civilizations rose to supremacy but eventually died or scattered, disappeared or transcended. During the time each world flourished, those that ruled it spoke to the stars, reengineered their physical bodies, and mastered form and essence, all in their own unique ways. The people of the new world—the Ninth World—sometimes call these remnants magic, and who are we to say they’re wrong? But most give a unique name to the legacies of the nigh-unimaginable past. They call them - NUMENERA. 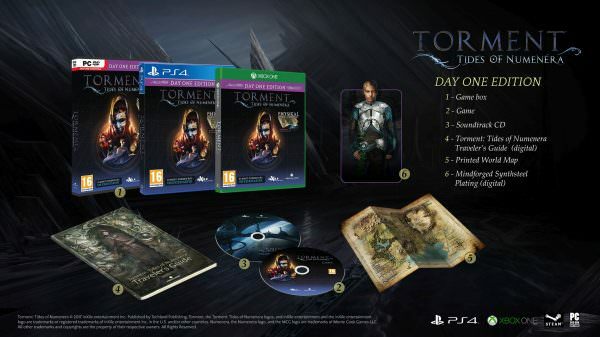 Torment: Tides of Numenera is seen (by many) as the successor of Planescape: Torment, however its set in a compeletly different world and there is no indication it is a continuation of old story. There might be some cameos but we are unlikely to see old friends like Fell-From-Grace or Morte. However,the Numenera world is freshing and equally interesting as the D&D Planescape setting. Set in a far distant future, Torment:Tides of Numenera puts a new spin on traditional fantasy, creating something unique to reinvigorate the imagination of gamers everywhere. Player characters explore a world of ancient mystery and danger to find leftover artifacts of the lost civlizations: bits of nanotechnology, the datasphere threaded among still-orbiting satellites, bio-engineered creatures, and myriad strange and wondrous devices that defy understanding. Numenera is about discovering the wonders of the worlds that came before, not for their own sake, but as the means to improve the present and build a future. In a sense it is fantasy version of fallout. 1,A Deep, Thought-provoking and Satisfying Story. The philosophical underpinnings of Torment drive the game, both mechanically and narratively. Your words, choices, and actions will be your primary weapons. 3,A Rich, Personal Narrative. The story is thoughtful and character-driven; epic in feel but a deeply personal narrative, with nontraditional characters and companions who have their own motivations and desires that drive them throughout the game. 4,Reactivity, Choice, and Real Consequences. The game emphasizes replayability and reactivity, and your choices will make a real difference. You can play the game with a different approach and discover entirely new pathways. Most important, we won't tell you how to play. The "best" ending is the one that arises naturally from your actions throughout the game. The name "Numenera" is a reference to the bits of technology leftover from past civilizations. The word "numen" is a Latin root word meaning a "pervading divine presence" and "era" refers to the period (1 billion years in the future) in which this universe takes place. The world is utterly filled with "nanites" (the divine presence) that some beings in this universe can tap into and control. With a nod towards Clarke's Third Law, "any sufficiently advanced technology is indistinguishable from magic", the setting treats technology with much the same approach as magic in a fantasy setting. The native tech level is roughly medieval.